Iain Thomson is associate professor of philosophy at the University of New Mexico. His book Heidegger on Ontotheology: Technology and the Politics of Education was published last year. This interview was conducted via email. Ereignis How did you come to be interested in Heidegger's philosophy and his politics in particular? Iain I remember reading Thomas Jefferson in high school; he wrote so eloquently about our human need for freedom that I got choked up just reading him. When I found out he'd had slaves I was stunned, traumatized intellectually, but I lacked the resources to work through it very far at the time. Reading Heidegger a few years later I had a similar experience, only magnified and more complicated. As I read Heidegger's later work in Hubert Dreyfus's wonderful "later Heidegger" course at UC Berkeley, I had that strange experience Emerson describes as our own ideas returning to us with "alienated majesty"; here, I thought, was someone who had eloquently expressed ideas that I felt were at the core of my own thinking but that I had never managed to articulate adequately. I was deeply moved by Heidegger's critique of our increasingly nihilistic treatment of our world and each other as meaningless resources to be optimized and I was inspired by his vision of poetic thinking as a way out of this historical nihilism. Then I found out he'd been a Nazi. (I think Dreyfus did not drop that bomb until half-way through the semester.) I was intellectually traumatized once again. But this time I didn't let the question go: How could the greatest thinker of the twentieth century have thrown the weight of his thinking behind its most horrible political regime? That's something I've been struggling with for almost twenty years now. (It is perhaps not so surprising that this question would fascinate me, given that I was raised by a politician and a forensic psychiatrist.) I believe I made some real progress in understanding this difficult and controversial issue in Heidegger on Ontotheology: Technology and the Politics of Education, and I hope to disseminate the view I presented there to a broader audience in a book I'm working on now, an intellectual biography of Heidegger. Ereignis There's certainly an inclination to turn people one admires into personal heroes, especially early on. I assume that tendency declines as one learns more details about the lives of the Jeffersons and Heideggers. People also seem to be more disappointed when they learn of the moral faults of philosophers than they are with others. For example, we don't find Heisenberg referred to as a Nazi physicist. His political affiliations are very much secondary, if not entirely irrelevant, to his contributions to science. On the other hand, when Heidegger is mentioned in the general media, his party affiliation is referred to more often than not. This happens even though Heideggerâ€™s specialty, ontology, is even more abstract and divorced from current events than physics. He is not read today because he was an ethicist or political philosopher. His contributions to the philosophical enterprise are down in the foundations of the edifice, concerning what it is that makes sciences, knowledge, and one's understanding of things possible. Should we expect philosophers' lives to be exemplary and to hold them to higher standards, much as contemporary society does with athletes, but not with scientists? Iain It's true that when I was young and at my most idealistic, I expected great thinkers simply to practice what they preach (and preach what they practice). Then, a little older, more heartbroken, I read Nietzsche, and was convinced by his cynical but illuminating view that philosophy is only obliquely autobiographical, but that these oblique angles can be charted by the "psychologist" who recognizes that the heights of a philosopher's idealizations are often a direct but inverted reflection of their own personal failings. (Nietzsche thus provides a nice context for Harry Frankfurt's telling observation that ethicists are often the least ethical people.) That might often be true, sadly, but it's still too easy an answer; I think our need for heroes who are not just hypocrites is not something we should naturally outgrow as we mature. Nietzsche himself taught that if we are not to give up our hope for a better future (that is, hope itself), we need genuine heroes to inspire us, not sham heroes who sell us something, or who we celebrate one day and laughingly destroy the next, but real heroes whose example we try to carry on somehow in our own lives. (I wrote a paper, "Deconstructing the Hero," that explores Nietzsche and Heidegger's fascinating views on this subject in the context of contemporary Western culture; it's now published and posted on my webpage.) I would like to avoid the simplistic dichotomy of either excusing hypocrisy or else using it as an excuse to dismiss any philosophy at odds with the life of the person advocating it. Of course, it's easy to laugh at the idea of William Bennett using his high-paid lectures on virtue in order to lambaste the sin of gambling, then going to Vegas to burn his honorariums at the craps table, but, although I've never read Bennett's work, I'd predict that he would have some real insights into gambling (buried under his rhetorical fire and brimstone), since he actually knew what he was talking about. (Just as, to put Frankfurt's point in a more generous light, it makes sense that the philosopher who really struggles to behave ethically might well develop some interesting insights into ethics.) Heidegger was never sympathetic to "ethics" understood as the attempt to provide action-guiding principles; like Nietzsche, he saw such rules as a way of controlling the herd -- and this led to some real problems in Heidegger's personal and political life, obviously. Still, the later Heidegger's own important attempts to articulate an "originary ethics" -- that is, and ethics pitched at the level of our "ethos" or being-in-the-world -- suggest that ethics should help us develop a comportmental attunement to the world in which, real difficulties notwithstanding, we continue to struggle to live in a way that's consistent with out best philosophical insights. In fact, my work tries to show how Heidegger's later ethical and political insights emerged from his appalling misadventure with Nazism, as philosophical lessons learned, even if he himself was too proud to ever put it this way. You make a good point about how Heidegger is always introduced as a Nazi whereas Heisenberg is not. One rarely hears anyone complain that Frege's important contributions to the formalization of logic seem to follow from the same overriding desire for "purity" that generated his raging anti-Semitism. In a way, however, I think that's fair, because, in my view, Heidegger's philosophical insights are much more closely connected to everyday political and cultural events than are Heisenberg's or Frege's. Indeed, I suggest in Chapter 3 of Heidegger on Ontotheology that the inclination to separate Heidegger's philosophy from his life and times in an understandable but unfortunate residue of earlier days, when it looked like Heidegger's work had to be insulated from his disastrous politics in that way if his ideas were to survive. I think we're past that now; at this point Heidegger's important insights can no more be uprooted by being ignored than Freud's can; they've already come too deeply to permeate much thinking in the humanities. So, I don't think that Heidegger's insights into ontology can be -- or ever were -- divorced from everyday events, and precisely for the reason that you state: Heidegger's thinking is "down in the foundations of the edifice" of science and culture. My work on ontotheology is meant to show how small changes in this underlying ontology can have profound and important repercussions at the level of our everyday historical self-understanding and the practices that follow from and feed back into it. For Heidegger, the bedrock of history is ontotheology, and these ontotheologies quietly but decisively shape our everyday sense of what is and what matters (or doesn't matter). Ereignis Clearly ontotheology is critical to your understanding of Heidegger, yet it is not a common word. Although the word was first used by Kant, it refers to matters discussed by philosophers at least as far back as Aristotle. And, as is the case with many other words, Heidegger attached his own particular meaning to it. Since not everyone reading this interview will be familiar with your book, can you explain briefly what Heidegger means by ontotheology? For Heidegger, metaphysics is not the abstruse concern of philosophers isolated in their ivory towers; metaphysics structures our very sense of reality. Metaphysics is "the history that we are," as Heidegger puts it. As this suggests, our sense of reality changes over time. I explain this view in terms of what I call "ontological holism." Put simply: Everything is, so when we change our sense of what-is, we change our sense of everything. (This idea that our basic sense of reality changes with time is Heidegger's doctrine of "historicity," which runs directly counter to the common-sense view that humanity's basic sense of reality must be relatively stable. Here, however, common sense falsely generalizes and so reifies its own historical understanding of being.) Heidegger's famous deconstruction of the history of ontology shows that there have been a succession of at least five different historical "epochs" (the pre-Socratic, Platonic, medieval, modern, and late-modern), five overlapping but relatively distinct and coherent constellations of intelligibility, each of which can be distinguished by its different historical sense of what-is and what matters. Ontotheology comes in at this point, because Heidegger thinks that a series of different ontotheologies provides the shifting conceptual bedrock for these different historical epochs. The "metaphysics" Heidegger is interested in -- by which he primarily means the views that shift and structure our basic sense of reality -- are what he calls ontotheologies. For him the great metaphysicians are all ontotheologists (although not all ontotheologists are great metaphysicians, because not all of them successfully shift our sense of reality). Here it helps to think historically. I argue that the ontotheological tradition begins with Thales and Anaximander -- in other words, it goes right back to the beginning of Western philosophy as such. Remember that Thales understands the archÃª or "ground" of reality as water; this means he conceives of water as the constituent element out of which everything else is fundamentally composed. Thales is thus the first ontologist, and the contemporary physicists who argue about whether the fundamental elements of reality are subatomic particles or superstrings continue the ontological endeavor he inaugurated. A few years later, Thales's student, Anaximander, understood the archÃª or ground of reality in a markedly different sense when he envisioned apeiron, the indefinite or unlimited, as the ultimate source from which all entities emerge and to which they return, and which thus justifies (or, in his case, condemns) existence as such. (For Anaximander, nothing deserves to exist because discrete existence requires definite form, an unjust violation of the indefinite for which we pay penance by ceasing to exist as entities and returning to the indefinite source.) Anaximander's attempt to understand the ground of reality by getting outside it, taking up the god's eye perspective or "view from nowhere," explains what Heidegger means by the theology in ontotheology. If Thales was the first ontologist, and Anaximander the first theologist, Plato is the first onto-theologist (or "the first metaphysician," as Heidegger often says, because Heidegger understands metaphysics proper as ontotheology). In Plato's middle-period, he implicitly conceives of the forms both ontologically and theologically. For example, Platoâ€™s "Symposium" presents the form of beauty both (1) as that common core which unites all the different kinds of beauty (explaining why beautiful bodies, beautiful artworks, beautiful state constitutions, and so on, are all beautiful), and also (2) as the most beautiful of all that is beautiful, as the supreme exemplar of beauty, which is much more beautiful than anything that can be found in this world (a view which, Nietzsche points out, condemns the Platonist to a nihilistic dissatisfaction with the beauty of this world). Aristotle, as you suggest, is the first to distinguish between the two different ways of understanding the "ground" of reality. Aristotle is the first explicit ontotheologist, we might say, and his ontotheological distinction between primary and secondary substance or presence (between the "what" and the "that") exercises a formative influence on medieval philosophy (leading to the distinction between essence and existence) and so inscribes this ontotheological ambiguity into the core of the Western tradition. On Heidegger's reductive but revealing reading of Nietzsche, even this avowedly anti-metaphysical thinker understands the being of what-is ontotheologically, as eternally-recurring will-to-power. Here's my punch-line: Although no one seems to have seen this before, Heidegger thinks that our current "technological" understanding of being is rooted in this Nietzschean ontotheology. This understanding of the being of entities as eternally recurring will-to-power, that is, as forces coming together and breaking apart endlessly, structures our current sense of reality, reinforcing a technological "enframing" by which we understand and so increasingly reduce all entities, ourselves included, to the status of intrinsically meaningless resources (Bestand) standing by for efficient optimization. So you are right that ontotheology is central to my account of Heidegger. This is because I think Heidegger's understanding of ontotheology provides the crucial philosophical background for both the critical and positive dimensions of his later work. Indeed, my book seeks to show that our understanding of Heidegger's later thinking is greatly deepened and enriched by taking his view of ontotheology into account, for doing so allows us to better understand, more sympathetically interpret, and more persuasively defend his later work on such important issues as ontology, technology, and education -- and, I also suggest, the relation between his philosophy and Nazism. Ereignis As your book is subtitled "Technology and the Politics of Education", I would like to ask you about education today and Heidegger's criticism of the university. In his inaugural speech at Freiburg Heidegger criticized the hyper-specialization of the university, especially in the sciences. From your perspective, teaching in a university, how would you compare the situation today to what Heidegger was criticizing in the 30's? Iain That's an important question. I show in the book that Heidegger's critique of the university was extremely prescient, and that, unfortunately, many of the problems he diagnosed have grown more serious in the meantime. As you say, Heidegger was deeply worried about the effects of hyper-specialization. As the different departments become more specialized, they develop their own topics, methods, and standards, often incommensurable with one another, and the shared conversation about what it all means evaporates, leaving only the residue of empty catchphrases like promoting â€œexcellenceâ€� (a rhetoric I suggest in the book that we should seize upon and strategically re-essentialize along Heideggerian lines). To put it simply, research increasingly takes place at a level of magnification that makes it difficult to pursue the big questions. Those who try to ask them often look like dilettantes, exceeding their legitimate academic territory and clumsily stepping on the toes of narrow specialists. Still, the question remains: How do we put all the different bits of knowledge discovered by the various researchers together into a meaningful whole? As researchers focus on an ever more finely differentiated object domain, the risk of losing the forest for the trees grows. The "Uni-" in University suggests a unity, a unified universe of knowledge: We are all investigating the same reality from different perspectives. But who in the university is responsible for the synthetic task of trying to figure out what all our various analyses add up to? Heidegger's answer is: The philosopher. Heidegger's original idea -- between 1927 and 1933 -- was that all the different positive sciences typically overlook a basic ontological question. Biologists tell us how life functions, psychologists discover how consciousness works, and historians explain historical events, for example. This work is often useful and important, but researchers in biology, psychology, and history do not tell us what life IS, what consciousness IS, or what history IS. Researchers presuppose rather than answer these ontological questions; indeed, they must have already answered such questions simply in order to be able to pick out the appropriate object-domain to study. A historian, for example, already has to have some sense of what history IS in order to sort those artifacts and events destined for history books and museums from those headed for oblivion. Anticipating Kuhn, Heidegger saw that these ontological questions do get raised explicitly during times of scientific crisis, when the presuppositions normally guiding a science get called explicitly into question. When biologists and philosophers of life debated the issue of so-called "artificial life" in the 1990s, for example, they did raise and debate the question of what life IS. (Is life just a "self-replicating system"? If so, then aren't computer viruses alive? Why, then, aren't the self-replicating proteins responsible for mad-cow disease "alive"? Just because we can't "kill" them?) Heidegger believed that the philosopher is called to help researchers answer these kinds of ontological questions. In so doing, we can work toward understanding not just what life IS, what history IS, what consciousness IS, and so on, but also the common kind of "IS-ness" that all these different object domains share in common. In other words, what is the sense of being that is common to the being of life, the being of history, the being of consciousness, etc.? Answering this question is the task of "fundamental ontology" -- the attempt to understand "the meaning of being in general" -- which Being and Time promised, but in the end failed to deliver. You can see, however, that the philosopher -- here, Heidegger -- who understands the meaning of being in general would thereby understand what all the different academic departments share in common, and would thus be able to unify the university (and, behind the university, Heidegger thought, the German nation itself)... This is the ambitious task that Heidegger fatefully pursued when he became the first Nazi Rector of Freiburg University in 1933. (Again, I am massively simplifying the last half of my book, skipping over a lot of important details and complications.) I show that Heidegger learns several important philosophical lessons from the failure of his attempt at direct political action, and that these lessons lead to his later views on the university. Most importantly, he comes to see that the university is not unified by an ahistorically-binding fundamental ontology that the philosopher needs simply to uncover from the history of ontology. When Heidegger carries out the deconstruction of the history of ontology famously called for in Being and Time, he comes to see that there is no shared, substantive sense of the meaning of being in general waiting beneath history to be recovered. Instead, Heidegger -- to cut a long story short -- comes to see that there is a history of being, that is, a history of different, ontotheologically-structured ways of understanding of the being of entities. (I think this historicization of ontology is the definitive transformation that distinguishes the "early" from the "later" Heidegger.) Heidegger comes to see that the contemporary university is unified by all the different departments' growing adoption of that particular "technological" ontotheology that implicitly governs our entire historical age. What contemporary biologists think life IS, for example, is drawn from (and reinforces) the "Nietzschean" ontotheology of eternally recurring will-to-power.Â We should not be so surprised, then, that the received (neo-Darwinian) view that life is just a self-replicating information system leads to the view that computer viruses, technological entities par excellence, are alive! Indeed, Heidegger's view predicts that all the different departments will understand the being of the class of entities they study (the living, the historical, the conscious) in terms taken over from this nihilistic ontotheology, and his later work suggests ways in which we might uncover, resist, and overturn these nihilistic developments. I thus argue that the later Heidegger does not give up his project for reforming the university, but instead refines it in ways that are important for those of us who are seeking to respond to the ongoing university crisis to understand. In short, the problems of specialization have grown much worse. Heidegger was worried that the different departments were finding it more and more difficult to communicate across their specializations. Now, however, these departments themselves are internally fractured and fragmented, increasingly unable even to discuss their topics among themselves. There are battle-lines in almost every department, with the would-be scientists, employing empirically-measurable methods for quantifying their object domains, generally winning-out over the more traditional humanists, who seek to keep the big questions alive, despite the notorious resistance of such questions to quantification. In my own field, philosophy, "analytic" philosophers, who aspire to the exactitude of mathematics, have achieved a near hegemony over the discipline. So-called "continental" philosophers who -- following in the footsteps of brilliant, poetic thinkers like Nietzsche, Heidegger, and others -- continue to question the metaphysical presuppositions most analytic philosophers take for granted (insisting on an attentiveness to the historical baggage attendant on concepts such as "representation," "consciousness," and so on) find themselves running up against analytic effots to establish a "normal science" research program, and so seem to be in the process of being marginalized, absorbed, or driven out of philosophy into departments of literature, religion, and so on, or out of the academe all together. I find this breakdown of communication within philosophy itself particularly troubling, no doubt because I frequently experience its effects directly myself. Caught between the "analytic" and "continental" territories (I am lucky enough to count Bernard Williams, Hubert Dreyfus, and Jacques Derrida among my teachers), I find myself something of a "coyote," as we say in New Mexico -- that is, a border-crosser, smuggler, or trickster -- too â€œcontinentalâ€� for the analytics, too â€œanalyticâ€� for the continentals. Still, I also see signs of hope here, because I think the best way out of the current impasse is to find a middle-way between the warring factions, seeking to translate the deep philosophical insights of the continental thinkers into a language clear enough for the analytically-trained philosophers to be able to understand, but not so technical as to alienate those without much analytic training. My book tries to do this, and the final chapter suggests a philosophical vision for how we might go about restoring a sense of education's intrinsic meaning and worth and so more effectively respond to the growing crisis in higher education. Without some such response, however, I worry that the big picture looks rather bleak. Ereignis It would appear that as knowledge evolves into different areas, picking up more details, that specialization will inevitably increase. To anyone interested in the perennial questions that drove philosophers through the ages, what passes for philosophy in many Anglo-American universities can be disappointing. As you mentioned, there is an inclination towards results that can be calculated, leading to the privileging of logic and philosophy papers that read like they are intended for math journals. Yet despite that, not being in the academy myself, the situation doesn't strike me as all that dire. For example, I browse the philosophy section of bookstores whenever I travel, and my impression is that more of Heidegger's works have been translated into English than any other language. I also read that in fields as reliant on results and calculation as physics, there are leaders complaining that they have to broaden their perspective, think less about results, and more about what they are trying to accomplish, if physicists are get a better understanding of the universe, rather than merely filling in more details. Universities are large institutions and one doesn't expect them to change rapidly, even if philosophy were to have a broader role in the future. However, a person entering higher education does have certain choices ahead of them. It's been centuries since an educated person could keep abreast of all new developments by reading every book published, and even then, doing so required a certain amount of leisure time. There are also fewer positions open to professional philosophers than students interested in the subject. In your book, you recommend an "ontological education". Should students avoid specialization entirely? Should they take certain classes to learn to think ontologically, whether they're studying fundamental principals or specialized skills? What choices would you recommend to someone entering the university today? It is great that Heidegger is so broadly translated into English and, although I suspect that most of these books are not being bought by American professors of philosophy, Heidegger himself would surely be encouraged to see his ideas spreading beyond the professional philosophers. As a teacher of philosophy by training and profession, however, I remain troubled by the fact that Heidegger's ideas resonate more strongly outside American philosophy departments than within them. As you suggest, it's a very good sign when physicists and computer programmers start calling for "calculative," means-end optimization to be supplemented by "meditative" thinking, thinking that reflects upon the meaning of things. They are right to do so, too, since the car tends to crash when all we have are mechanics optimizing its components and no one asking about where we are heading... When we're all just optimizing our particular sparkplugs we end up with a car going faster and faster right over a cliff! The last chapter of my book thus seeks to uproot the rampant, instrumental justifications of education by developing Heidegger's alternative vision of ontological education. There I articulate a perfectionist understanding of the intrinsic meaning and value of education as a revolutionary return to the self. â€œOntological educationâ€� turns us away from the world as we ordinarily experience it, helping us recognize the usually unnoticed ontotheological lenses normally structuring our experience, and then turns us back to the same world, which we now see differently, more critically but also more freely, with eyes that have been opened. How exactly education can do this is the subject of my final chapter, and I'm happy to say that this aspect of my book has already begun to receive an enthusiastic response from philosophers of education as well as from students themselves, who seem to recognize and respond to the passion these pages express. This perhaps suggests a generalizable life-lesson Heidegger probably learned from Kierkegaard; one does well to keep one's options open long enough to discover what one really wants to be, but then one needs to take the risk of committing to that life, embracing and seeking to develop it at the expense of a number of other possible paths, despite the anxiety and guilt that accompany such a defining-leap, which a meaningful life requires. (The difference between the secularizing Heidegger and the devoutly religious Kierkegaard here is that, to stay with this example, the Heideggerian can get divorced, if the marriage collapses and cannot be reconstructed. Concerning our defining existential commitments, Heidegger suggests that -- as Haugeland nicely puts it -- we need to stick with it without getting stuck with it. I've explored this philosophical territory further in "Heidegger's Perfectionist Philosophy of Education in Being and Time.") So I'm not against specialization as such; in fact, I argue in the book that only the deep knowledge that comes from specialization will be able to yield persuasive, alternative answers to the big questions, but to motivate such new answers we need to keep these big questions alive. I know of no better way to do this than to study Heidegger, critically but sympathetically addressing the profound and troubling questions with which his thinking continues to confront us. Ereignis I love the duck/rabbit trompe-l'oeils, especially as analogies, for ereignis/enteignis, or appropriation/expropriation. As something come into presence, or disclosure, something else disappears into the background. You allude to Heidegger's notion, via HÃ¶lderlin, that humans become most withdrawn from being, they may also approach a breakthrough to being -- the darkness before the dawn. Heidegger also refers to that epochal change by the term Ereignis. Earlier you referred to "ontological holism", to transformations that "change our sense of everything." I was wondering if ontotheology, which unites both bottom-up and top-down explanations of metaphysics, could also help us make sense of Ereignis as both a "process whereby human beings actively participate in the becoming-intelligible of their worldly environments"* and Ereignis as an epochal, god-that-is-to-save-us, event. Iain Yes, and I love it too. 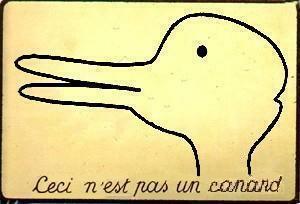 As you know, I use that duck/rabbit figure in "The Danger and the Promise of Heidegger" to explain the esoteric but, for Heidegger, absolutely crucial connection between the "danger" of technologization and the "promise" of another, non-nihilistic way of understanding and relating to ourselves and our worlds. Near the end of that essay, I cite Heidegger's private remark to Gadamer (as related by Gadamer's student, Gianni Vattimo) that Heidegger remained most troubled, near the end of his life, not by his Nazism ("alas," Gadamer adds), but by his own sense that he had failed adequately to illuminate that Gestalt flip in which Enframing is instantaneously transformed into its opposite, the "event" of Ereignis. Heidegger most clearly expressed this mysterious view by saying that "enowning is the photographic negative of enframing." Of course, you probably know better than anyone that the meaning of "Ereignis " is a vexed topic, since your site is, among many other things, a kind of massive trophy case collecting and displaying the many different and often seemingly incompatible translations, definitions, and explanations of this crucial Heidegger term of art. The main reason for this astounding variety, beyond the difficulties inherent in the language Heidegger uses when he writes with (and, very rarely, about) Ereignis, is that Heidegger himself employed the term is a wide variety of different senses throughout his life, as Richard Polt shows in his excellent essay on the subject in Blackwell's A Companion to Heidegger. (I've criticized Polt's work in the past; in fact, I try only to criticize work I think is really strong and so deserving of critical attention -- I was taught to "Let the dead bury the dead" -- but I like Poltâ€™s work and really appreciate the way he writes so clearly about the most difficult topics in Heidegger and so appeals to both the "analytic" and "continental" wings of Heidegger scholarship.) As Polt's work suggests, a lot of genealogical work remains to be done tracing and explaining the MANY different ways Heidegger used Ereignis throughout his life. Still, in answer to your question, my view is that we can't make much sense of the later Heidegger's main understanding of Ereignis -- to designate an historically-transformative truth event (or "God") that, in an instant, takes us beyond technological enframing -- without understanding his views on ontotheology. The "danger" of technologization has to be grasped at its roots, and the roots of enframing are ontotheological, as I mentioned earlier. Heidegger thinks that the ongoing technological enframing of reality is an expression of our Nietzschean (or neo-Darwinian) ontotheology of eternally-recurring will-to-power. This nihilistic understanding of the being of entities "enframes" our sense of reality by increasingly leading us to relate to all entities as intrinsically meaningless resources to be optimized. If we can understand the danger as the danger, that is, if we recognize that this relentless optimization is rooted in the ontotheology underlying our age, then we can come to understand this ontotheology as the way being as such happens for us today: paradoxically, being happens by not happening; it "comes across" by "staying away," Heidegger writes. This is the central mystery to his later work. Our ontotheology reduces being to nothing; in other words, eternally recurring will-to-power dissolves being into nothing but "sovereign becoming" (as Nietzsche said). But if we can see this "nothing" as the way being as such happens for us, then we can discern the "noth-ing" (or "nihilating") of the nothing, experiencing the way reality continually discloses itself in ways that exceed this empty optimization imperative. When I am appropriately open to any thing -- the trees, sky, and mountain out my window, myself, my daughter, even this computer -- I come to see that this being is more than just forces perpetuating themselves, and that "more," that â€œexcess,â€� is the promise. In experiencing this promise we experience the being of entities as more than mere resources to be optimized. For, when we learn to dwell -- and so become attuned to the phenomenological 'presencing' whereby 'being as such' manifests itself -- we come to understand and experience entities as being richer in meaning than we are capable of doing justice to conceptually, rather than taking them as intrinsically meaningless resources awaiting optimization, and so learn to approach them with care, patience, humility, gratitude, even awe. Such experiences can become microcosms of, as well as inspiration for, the revolution beyond our underlying ontotheology that Heidegger argues we need in order to transcend enframing and begin to set our world aright. That's probably the simplest and so the clearest way to put it, but here's another way to think about Heidegger's "point": The greatest danger is the reduction of being to nothing; the saving insight is to see this noth-ing as being. To see being as nothing is the very pinnacle (the "peak" or highest "point") of nihilism, but to see the noth-ing as being is already to see beyond nihilism (as on the peak of a mountain one looks down both slopes, as Derrida nicely observed). The switch from seeing being as nothing to seeing nothing as being is like the duck/rabbit; this Gestalt switch from noth-ing to being takes place in the same place.Â There is not some new â€œdataâ€� that we see; rather, we see the same â€œdataâ€� in a new way. That should help show how this relates to my earlier gloss on enowning as the way being happens, that is, as the rapprochement between being and human being or â€œthe process whereby human beings actively participate in the becoming intelligible of their worldly environments.â€� The connection is that passing from the danger to the promise, from enframing to enowning, requires taking some responsibility for the way reality happens for us. This means recognizing that we are in fact actively contributing to the world we seem passively to experience. As I explain at the beginning of Chapter 2 in the book, making the Gestalt flip we've been discussing requires shaking off the reification of the given as the true (as the only truth possible) by acknowledging what Kant called our "receptive spontaneity." We are not just passively receptive, our world does not just happen to us, we also spontaneously organize what we experience into a world. Heidegger historicizes this "discursivity thesis" of Kant's: Our experience of the world comes already shaped by ontotheology -- in our case, by an ontotheology which we need to recognize so that we can transcend its narrow and nihilistic reduction of our worlds to empty optimization. Ereignis Earlier you mentioned your essay, "Deconstructing the Hero", about the hero in the Alan Moore and Dave Gibbons graphic novel Watchmen. I was wondering if you've found any other comics to be philosophically stimulating? Iain Frankly, I find just about everything philosophically stimulating. (This tends to amuse my students and annoy my friends...) But, yeah, as I begin that essay by confessing, I'm a comic-book fan from way back. (I actually learned to read from comics, and I'm still learning...) I don't read comics very often anymore (the habit got too expensive), but I think Neil Gaiman is brilliant (I still read all his books) and Gaiman's fantasy epic, the Sandman, is probably the greatest comic I've ever read (and I've read a lot!). Of course, I think Alan Moore's Watchmen is amazing, for the reasons I explain in that essay, but I love almost everything Moore has written, including the V for Vendetta film that he in effect wrote (since the comic was initially the storyboard for the film) and then proudly disowned (which was a bit silly, but understandable, if you read my essay). I thought Spiegelman's book on September 11 (â€œIn the Shadow of No Towersâ€�) was interesting (although it was no Maus! ), but I also enjoy more mainstream fare like the X-Men and Ultimate Avengers comics (with Hulk as the rampaging id, Giant Man as an abusive husband, etc. 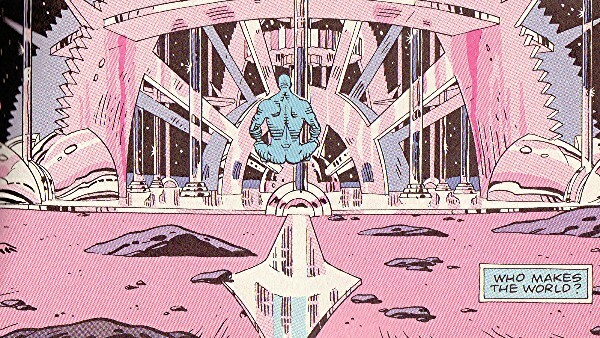 -- contemporary comics remain very much under the influence of Moore's Watchmen). In general, I think of myself as a highbrow-lowbrow, a serious philosopher who prefers comics to opera and who finds philosophical stimulation everywhere, from comics, to rap music, Hollywood film, television, the internet, and even in the unexpected moments and strange interactions of everyday life. Philosophy doesn't have to be pretentious to be serious; in fact, I think philosophers should be true to themselves (not to their super-egoic sense of what they should be); we should not all just be unconscious apologists for the cultural values of the upper-class! My first philosophy publication was a Heideggerian interpretation of the powerful horror film, The Silence of the Lambs, and one of my most recent works is a chapter ("'Even Better than the Real Thing'? Postmodernism, The Triumph of the Simulacra, and U2") forthcoming in Philosophy and U2 -- a book which, interestingly, will be very Heideggerian (it's edited by Mark Wrathall and includes contributions from him, Hubert Dreyfus, Beatrice Han, Jeff Malpas, and others; I think it'll be the best volume yet in Open Court's well known pop-philosophy series). Ereignis You mentioned earlier that you were working on an intellectual biography of Heidegger. I've read a few biographies of philosophers, but they've tended to focus on the person's newsworthy involvement rather than the development of their thinking. Have you read any biographies of philosophers that you consider to be exemplary? It sounds like a daunting assignment. Are you planning any other Heidegger related work in the near future? Iain I thought Terry Pinkard's Hegel and Alastair Hannay's Kierkegaard were great, precisely because they were so philosophical, and my Heidegger biography will be in that same Cambridge series of philosophical biographies, biographies by philosophers about philosophers. I have neither the inclination nor the aptitude to report on what Heidegger had for lunch, or exhaustively chart his everyday comings-and-goings, but I do have long-developed views about philosophically significant matters such as the relationship between Heidegger's thinking and Nazism as well as his so-called "turn." Building on the story about all that which I tell in Heidegger on Ontotheology, my Heidegger biography will link the lifelong transformation of Heidegger's philosophical views to the fascinating and troubling events of his life and times. It will thus be a genuinely philosophical biography, showing how Heidegger's philosophy relates to his life (and vice versa), and so an explicit rejection of the long-standing tendency to try to cordon Heidegger's thinking off from his life (which is understandable in the light of his Nazism, but completely untenable philosophically) and of the related resistance among more orthodox Heideggerians to treating Heidegger's biography as a philosophically important subject. You're right that it's a challenging project, but in a sense I've been preparing for it for the last twenty years, rather obsessionally reading everything good that I could get my hands on by or about Heidegger and those he came in contact with. I'll tell the stories I know the best (some of which are just amazing) and then work hard to fill in the missing details. So if you or any of your readers have any personal Heidegger stories to share or anecdotes to pass along, I would certainly appreciate hearing them!